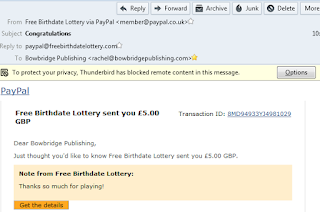 Turn One Pound Into One Million: Birthdate Lottery Win!! I never seem to win anything and so I could hardly believe when I saw that I had won the Survey Draw on the Birthdate Lottery. It was a fiver, granted, that is not a fortune, but I was still rather stupidly over excited to see my birth date there and a notification that I needed to claim my £5. What was even more lucky was that I was accidentally checking the draw 18 minutes early (It is at 11am) mistakenly thinking it was 11am. Had I waited until 11am it would have ticked over and gone unclaimed. I did check the site yesterday, but forgot to check the survey draw. 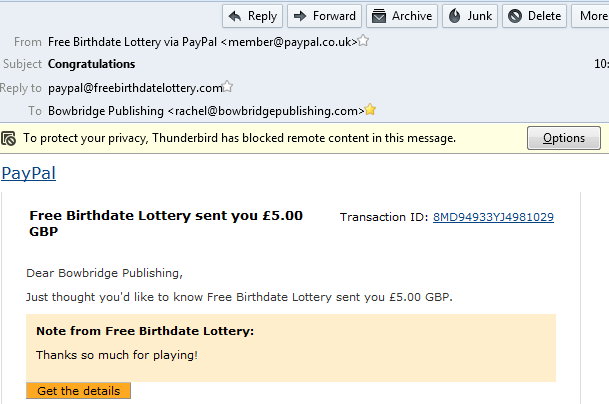 As you can see by the picture I was almost immediately sent an email confirming my Paypal payment. If you would like to have a chance of winning a crisp love fiver or maybe even a tenner if you are lucky, then pop over to the site. If you are already a member then pop back as it looks like there are a few new fun games on there - an Easter Egg Hunt and some Bingo. If you are new to signing up, I would love it if you could use my referral link, as I can get some extra credits that way. Thank you so much, good luck and enjoy! !